An undeniable source of pleasure in archives is the appearance of a writer’s doodles in the margins of books and manuscripts. 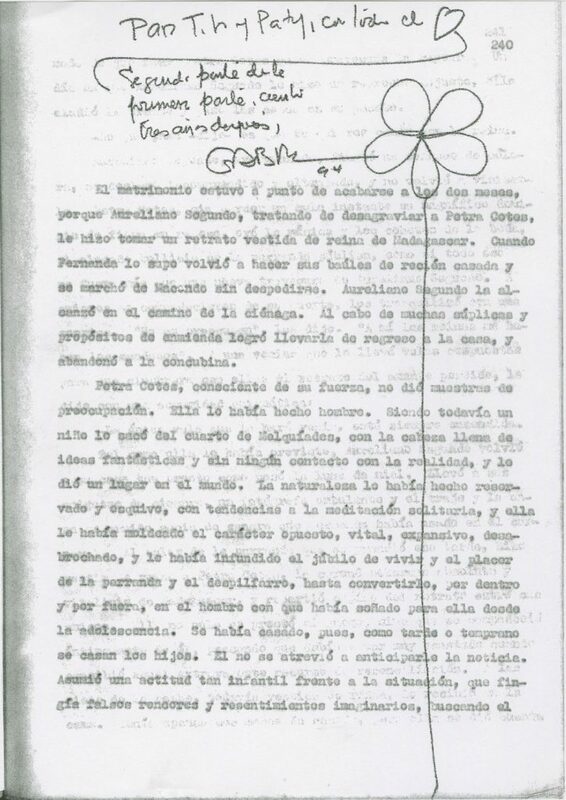 As we’ve digitized García Márquez’s papers for his online archive (a project funded by the Council on Library and Information Resources), we’ve come across a handful of playful drawings and notes, most frequently a bold “Ojo!” jotted on a manuscript draft. 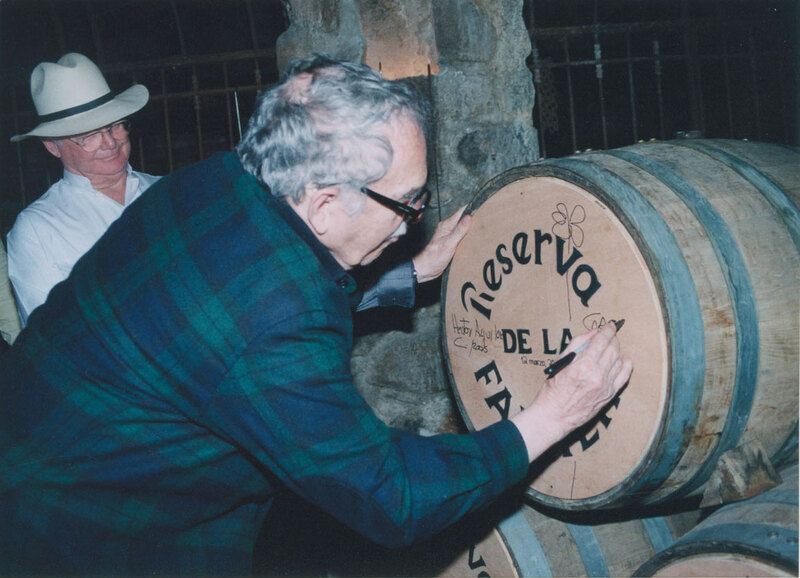 Gabriel García Márquez autographing a wine barrel, 2005. Photographer unknown. 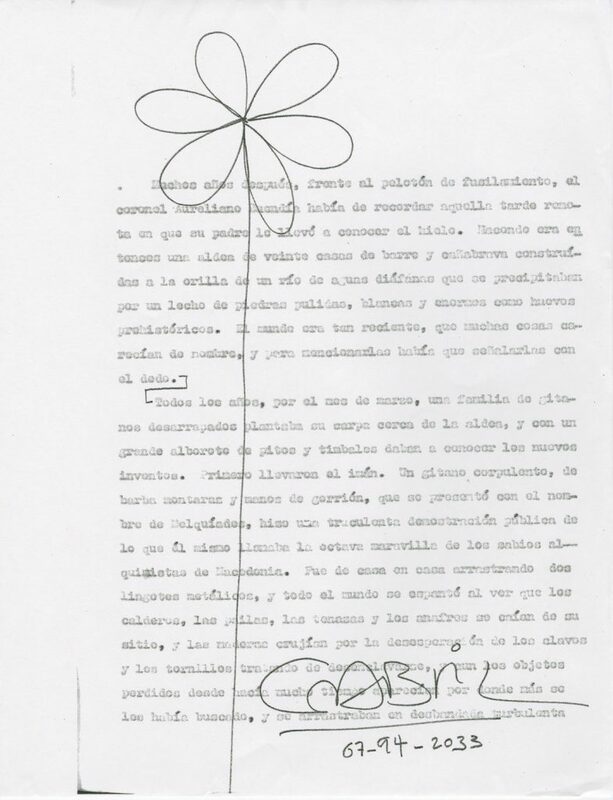 When we’ve encountered García Márquez’s signature it’s been accompanied by a long-stemmed flower, which the collection’s archivist tells me is tattooed on the arm of the writer’s granddaughter. 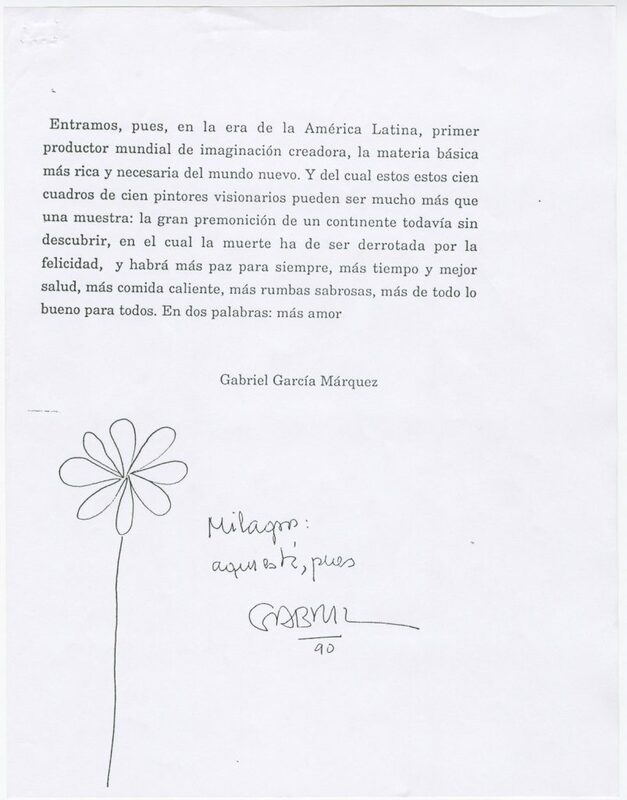 We found a photograph of García Márquez adding his autograph beside the flower on the face of a wine barrel, while a man in a white shirt and white fedora looks on smiling. 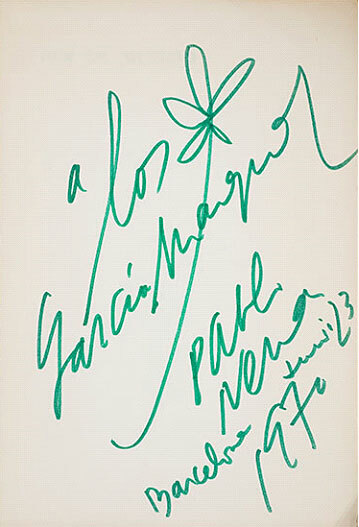 Our colleagues in cataloging noticed a similar flower next to Pablo Neruda’s signature in a book he gave to García Márquez. Mendoza: You always have yellow flowers in your house. What significance do they have? García Márquez: Nothing awful can happen to me if there are yellow flowers around. To be absolutely safe, I need yellow flowers (preferably yellow roses) and to be surrounded by women. Mendoza: Mercedes always puts a rose on your desk. García Márquez: What’s happened quite a few times is that I’m trying to work and not getting anywhere, nothing’s going right, I’m throwing away page after page. Then I look at the flower vase and find the reason… no rose. I shout for a flower, they bring it, and everything starts coming out right. There were—and still are—the showstopping flowers of the San Angel neighborhood in Mexico City, where García Márquez lived and wrote for more than five decades; the rain of yellow flowers in One Hundred Years of Solitude that fell from the sky and “covered the roofs and blocked the doors and smothered the animals who slept outdoors” after the first Buendía dies; and the yellow flowers handed out on the streets of Aracataca after García Márquez’s death. The author is known to have said that in the genesis of all of his books there was an image, and I’ve come to see the flower as the image linking the corpus of his diverse works. When a student told me that she was writing a paper on botanical allusions in García Márquez’s work, I thought of the flower again. We often see the natural world as evidence of our mortality. In García Márquez’s works, it’s that as well as proof of what the writer must have known all along—that the fruits of our imaginations, including what we make in this world, might never stop existing at all. Jullianne Ballou is a project librarian at the Harry Ransom Center. Es valioso y grato saber todo esto.